Since the 1970s, the Eagle has also been exported to Israel, Japan, and Saudi Arabia. Despite originally being envisioned as a pure air superiority aircraft, the design proved flexible enough that an all-weather strike derivative, the F-15E Strike Eagle, was later developed, and entered service in 1989. The F-15 Eagle is expected to be in service with the U.S. Air Force past 2025. Back in the early 1970s when this kit was first introduced, it was very much considered to be typical of modern Japanese kits. Its thick plastic, raised panel lines and minimal cockpit detail are very typical of first generation Hasegawa kits. Back in this time, whenever there was a new aircraft, Hasegawa was pretty much the first to do a kit of it. This resulted in several prototype kits being produced before the final configuration was determined. In the case of the F-15, these initial aircraft had square wing tips and both fin tip aerodynamic balances were the same size. They also had no other antennas on them. These planes also had a smaller speed brake. 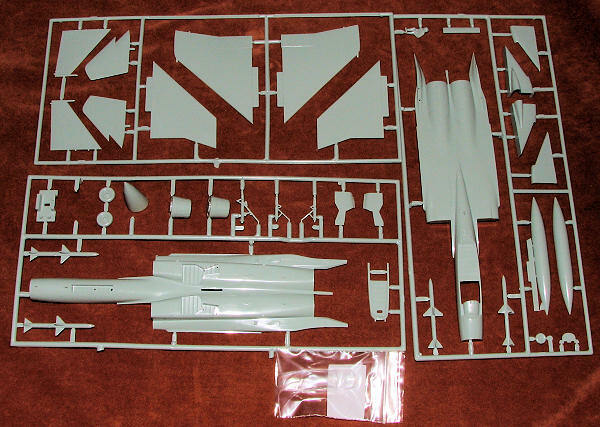 Later kits were modified to provide the standard features of the F-15A so if you want a very early plane, then this is the boxing you will need to seek. Also typical of the time, the cockpit is minimalist with a decal for the instruments and a basic seat shape. The seat in this kit was missing, hence the low price. The kit also does not have wing pylons and only has four Sparrows for the fuselage stations. It does have a centerline tank with the pylon molded onto one half of the tank. The plastic itself is somewhat thick and past experience with these types of kit has shown it to be a bit on the hard side. The raised panel lines are well done and you will find ejector pin marks on all sorts of parts, including the wheels and inside the gear doors. Instructions are old school with no paint manufacturer references, however, since this is the Minicraft boxing, they are in English. It really matters little as the kit is pretty simple by today's standards and construction will not be a problem. The ancient decals provide options for just about any of the prototype/pre-production single seaters. The main color of these planes is Air Superiority Blue with several of them having large da-glo patches on the wings and under the intakes. I have my doubts that the decals are still viable, but we will see. Many of these aircraft lasted well into the 1980s and by that time, the fuselages were White with International Orange in place of the da-glo. Those really wanting a modern F-15 kit will look elsewhere. Those who want a kit of the prototypes will want to seek this one out.